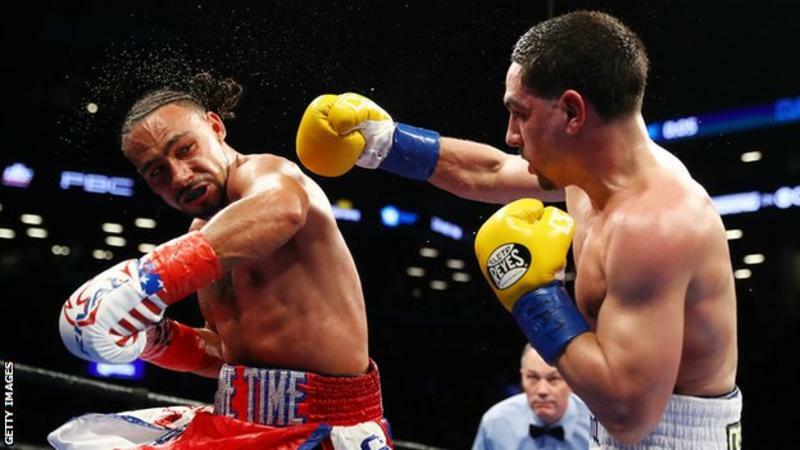 American Keith Thurman beat compatriot Danny Garcia by a split decision to add the WBC welterweight title to his WBA crown. The 28-year-old fighters went into the bout unbeaten, and Thurman protected his lead after a furious opening. Two judges scored the fight 116-112 and 115-113 for Thurman, while the other judge had it 115-113 for Garcia. "I was not giving the fight away," said Thurman. "I felt like we had a nice lead, we could cool down." Thurman remains unbeaten from 28 fights, while Garcia suffered his first loss in 34 bouts. Briton Kell Brook holds the IBF world welterweight title and his next fight will be against American Errol Spence Jr in Sheffield in May. NEW YORK — Keith Thurman fulfilled one of his childhood boxing dreams to unify world titles Saturday night in one of the year’s most anticipated fights. Although he didn’t finish strong, Thurman used an effective mix of boxing and power-punching — and put enough early rounds in the bank — to escape with a split-decision victory against Danny Garcia and unify welterweight titles before 16,533, the boxing attendance record for the Barclays Center in Brooklyn.